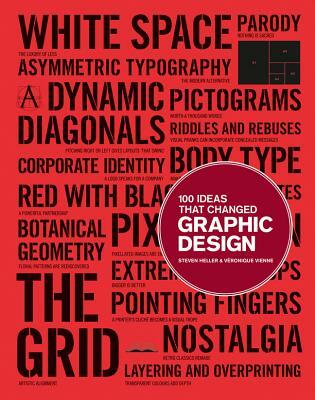 New in the "100 Ideas that Changed..." series, this book demonstrates how ideas influenced and defined graphic design, and how those ideas have manifested themselves in objects of design. The 100 entries, arranged broadly in chronological order, range from technical (overprinting, rub-on designs, split fountain); to stylistic (swashes on caps, loud typography, and white space); to objects (dust jackets, design handbooks); and methods (paper cut-outs, pixelation). Steven Heller is the co-chair of the MFA Designer as Author program and co-founder of the MFA in Design Criticism program at SVA, New York. For 33 years he was an art director at the New York Times. He is editor of AIGA VOICE and contributing editor to Print, Eye, Baseline and I.D. magazines. He is the author of more than 120 books on design and popular culture. He is the recipient of the 1999 AIGA Medal for Lifetime Achievement. Véronique Vienne has worked at a number of US magazines as art director, and is the author of The Art of Doing Nothing and The Art of Imperfection. A frequent contributor to Graphis and Metropolis magazines, she lives in Paris. FROM COOL HUNTING: "The scope is broad but intelligently refined, connecting all aspects of graphic design, from the age-old technique of text ornamentation to the relatively nascent appearance of pixelated images and digital type."